LIXIL Group Corporation, as a pure holding company, constantly and closely monitors the risks faced by Group companies, verifies how well they are hedging those risks, and offers guidance. As part of this endeavor, the holding company has made the establishment of Risk Management Committees mandatory in all Group companies. The Company regularly verifies the state of risk in each of the Group companies and studies the risk of Group companies through the Internal Audit Committee and the Risk Management Committee. When necessary, Group companies are requested to report before the committees. In addition, companies are required to report on risk at the Monthly Business Meeting and other meetings. The following business units that account for about 80% of the entire Group's sales conduct risk management activities in response to the characteristics of their business. In Japan, LIXIL Corporation, sales of which exceed 50% of the Group's sales, has established 16 risk management subcommittees under the Risk Management Committee that cover different themes and examine and manage risks horizontally across the organization. Each risk management subcommittee is allocated a specific risk. As part of our risk management promotion activities, risks are identified on a yearly basis and assessments are carried out, including assessments of impact on the business performance, frequency, and any weaknesses in prevention and follow-up measures. Furthermore, based on these assessments, targets are set, measures are proposed, and implementation schedules are formulated. PDCA (Plan, Do, Check, Act) management is carried out on a quarterly basis with the aim of implementing the proposed measures, making assessments, and monitoring the situation. LIXIL Water Technology in Europe, the Middle East and Africa faces geostrategic and economic macro-risks, operational risks and other types of risk, and management takes a comprehensive view in identifying significant risks and devising measures and proposals to combat them. In addition, based on a quantitative assessment of the likelihood and financial impact of a risk occurring, measures are proposed and implementation schedules are formulated by each factory, sales base, and functional headquarters. PDCA management is carried out on a quarterly basis with the aim of implementing the proposed measures, making assessments, and monitoring the situation. LIXIL Building Technology's overseas businesses are unlike other businesses as it conducts business on a project basis. Due to this factor, the bidding process for project is its most significant risk. Those businesses have set risk assessment producers and implement risk management. Following those producers, they evaluate risk relating to items such as contact contract conditions and financial states and others and complete the stipulated approval process before deciding whether to accept projects. Moreover, in the event of a crisis, a crisis management framework has been established for the entire LIXIL Group. The Group has laid down its Crisis Management Basic Policy stipulating such matters as basic policies, definitions and frameworks related to crisis management, and made these regulations known thoroughly in Group companies inside and outside of Japan. 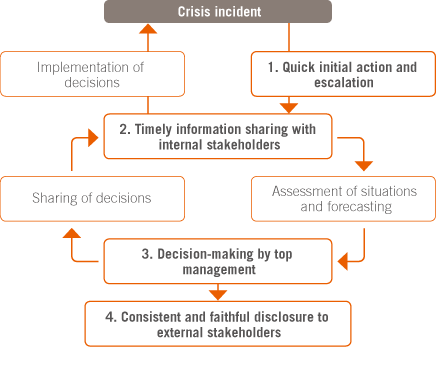 In the event of an incident occurring that could possibly develop into a crisis, a Company-wide response framework is clarified and efforts are made to minimize damage through rapid first response and escalation, timely sharing of information among relevant departments, management decision-making and proper external disclosure with consistency and sincerity. The LIXIL Group recognizes the importance of appropriate management of information as an integral part of business management. We have established the LIXIL Group Information Security Principles outlining our fundamental policy, to ensure information security across the Group. In order to ensure the protection and appropriate management of all information assets, the LIXIL Group maintains an efficient management structure that enables us to perform information security assessments and implement necessary actions based on the level risk. In the unlikely event of an information security breach, we are set up to minimize the damage, determine the root cause, and implement improvements to prevent reoccurrence. The LIXIL Group has established internal regulations regarding information security, and ensures that all employees are fully aware of the Group's principles regarding the protection and appropriate management of information assets. The LIXIL Group has security measures in place to prevent unauthorized access, destruction, leakage and falsification of sensitive information. The LIXIL Group provides training to all employees to boost their information security literacy and ensure appropriate handling and management of information assets. The LIXIL Group evaluates regularly the effectiveness of the initiatives mentioned above and makes continuous improvements to its information security management structure. The LIXIL Group has established global principles on intellectual property (IP) management, expanding the coverage of our IP management structure to include overseas subsidiaries, to maximize the value generated from IP and minimize associated risks across the Group. We aim to protect the fruit of our R&D activities from being imitated by competitors and differentiate our products, through effective protection and use of IP. We also share our IP assets with business partners as necessary for the purposes of creating high value-added markets for customers and strengthening our business relationships. We build, maintain and actively use the Group-wide IP portfolio, considering the strategies of each technology business, potential Group-wide synergies, and our long-term business strategy. We manage our IP strategically across all Group companies, through regular meetings as well as day-to-day contacts among members of the Intellectual Property divisions at the headquarters and overseas subsidiaries, product development personnel in each technology business, and R&D personnel at the headquarters and major global Group companies. At LIXIL Group, we protect our high-quality IP in order to differentiate our products and secure competitive advantage. We investigate whether the inventions and designs by our R&D divisions have 'prior art', and determine the value of applying for a business patent or design application, before making decisions on whether to license IP rights. Any infringement of third-party IP rights on our part through our business activities could lead to legal action, resulting ultimately in the suspension of sales or compensation claims. To avoid such risks, we investigate thoroughly third-party IP rights before starting operations. To ensure that the above mentioned activities are facilitated appropriately, we are actively enhancing the knowledge base and skill sets of employees involved in IP. We also provide IP trainings to managers and new hires.